David Mackenzie (HELL OR HIGH WATER) shifts gears to medieval Scotland for his Netflix film, OUTLAW KING. 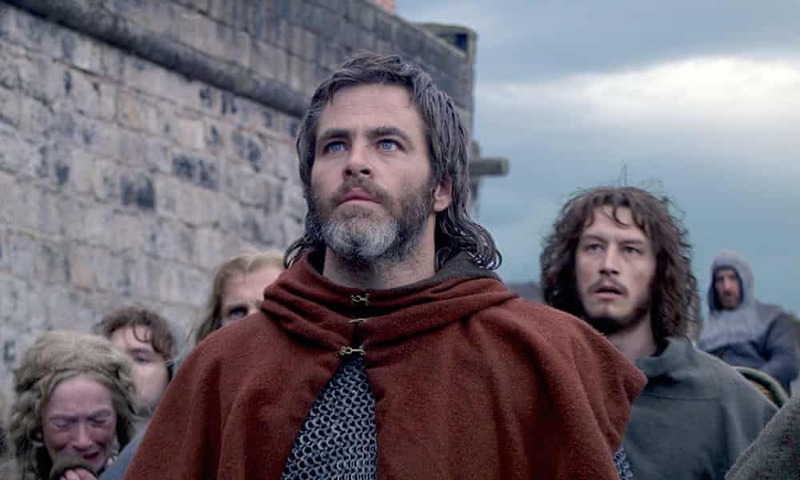 It stars Chris Pine with a dubious Scottish accent as Scottish clan leader and aspirant king, Robert Bruce. As the movie opens his dad is bending the knee to evil imperialist King Edward I of England (Stephen Dillane, the first of many GoT alum) - this is not a film that traffics in nuance. We are asked to believe that a newly head of the family Robert can anachronistically resist schtupping his new bride (feisty Florence Pugh) while also letting him get away with murdering his rival for the crown. This film REALLY wants us to like its protagonist! So Robert raises a rebel army and takes on the English, helped mightily by the fact that the legendary king dies leaving his moron son in charge. The film therefore culminates in a very cool battle scene that more than compensates for its dodgy accents, two-dimensional characterisations, and stilted opening twenty minutes. In fact, it's so well done, and so similar in concept to a key moment at Waterloo, that I basically now want Mackenzie to direct a film about that. Rare praise indeed from the woman who runs the @relivewaterloo twitter account and pretty much worships the Sergei Bondarchuk version! OUTLAW KING is rated R and has a running time of 121 minutes. The film played both Toronto and London 2018 and was released on Netflix last week.